Bear Lodge welcomes you home! 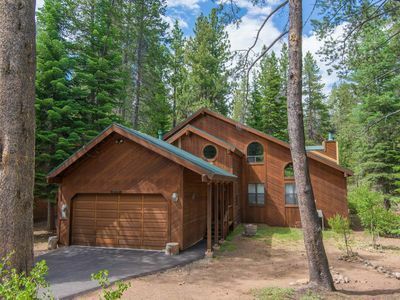 This spacious home is the perfect year-round family escape and is set in the beautiful neighborhood community of the Northstar Mountain Resort - just minutes from the slopes, hiking and biking trails and the charming Village at Northstar that offers 5-star amenities and activities for all ages. 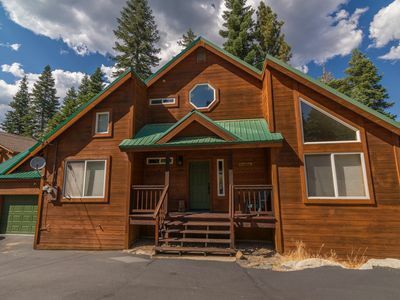 This 3040 square foot home is charming, themed in holiday flair with king size log pole beds in all bedrooms, quilted top bedding, lush linens a Family/Game Room and an outdoor deck that overlooks stunning views of mountain pines and the golf course. 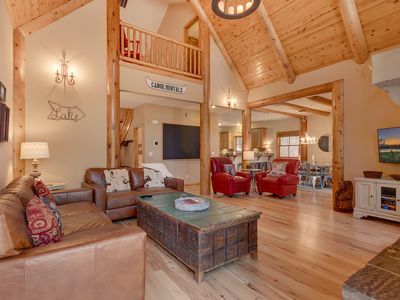 On the main level, Bear Lodge offers a large open floor plan that features a Great Room, Dining and Kitchen area with a breakfast bar (seating for 3) and a 1/2 guest bathroom located off the Great Room. 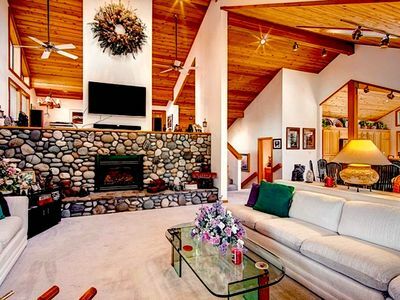 The Great Room boasts a grand stone-heart gas fireplace, oversized comfortable furnishings, large flat screen TV, cathedral ceiling, skylights and large windows beaming in natural light and mountain views. 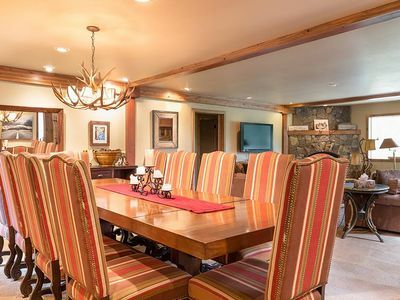 The dining area is adjacent to the Great Room and offers a round dining table (seating for 8) with easy access to the outdoor deck where you will find a gas BBQ and more incredible views. The kitchen is just steps away from the dining area. 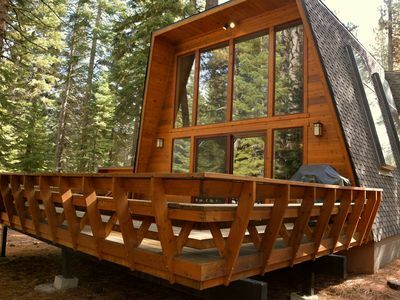 A sliding glass door off the kitchen conveniently leads to the outside deck. The well-equipped kitchen offers natural light with windows covering one wall that overlook the deck and fabulous views! Take a couple steps up from the Great Room and you will find yourself in the Loft. 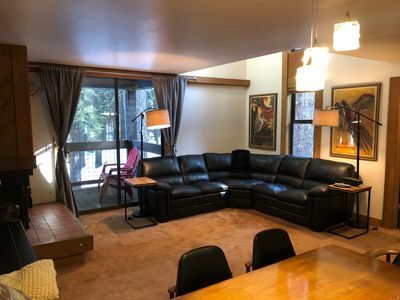 This cozy room overlooks the Great Room and is the perfect place for reading, playing games (equipped with a poker table) or curling up on the double sofa sleeper for quiet time or to get a good night sleep. Head to the lower level of Bear Lodge to find the Family/Game Room. This bonus room is ideal for entertaining! 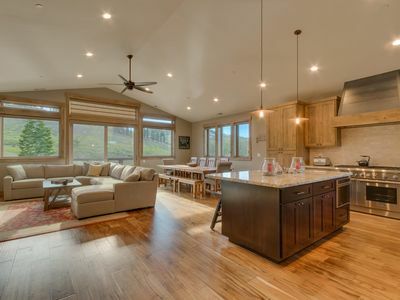 It offers a pool table, gas stove fireplace for those chilly days and nights, bar, large windows and a glass door (leading to deck) showcasing magnificent views. Surrounding the perimeter of the Family/Game Room is the 2nd Master Ensuite, 2 Guest Bedrooms and a full Guest Bathroom (with a shower/tub combo, large vanity w/1 sink). 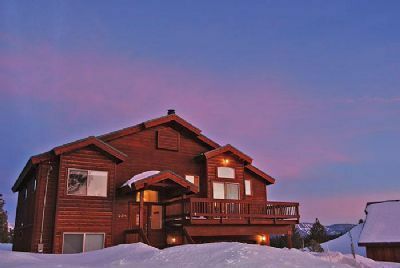 All bedrooms will meet your every need and features beautiful king size log pole beds with quilted bedding, flat screen TV's, roomy closet space and dressers. 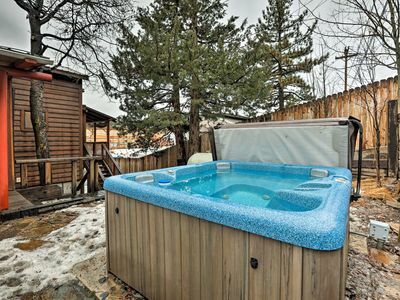 The Master Ensuite bathroom features a sunken jacuzzi tub, separate walk-in shower, spacious vanity with 1 sink, private lavatory and plenty of closet space. Venture back up the stairs to find the 1st Master Ensuite located off the foyer at the entrance of Bear Lodge. The ensuite bathroom offers a charming pedestal combo sink and a private shower/toilet area. Lastly, the laundry room is located off the main level and features a full size washer/dryer with a door leading directly to the spacious garage. Parking for one vehicle is available on one side of the garage as the other side host game tables for guest to enjoy. 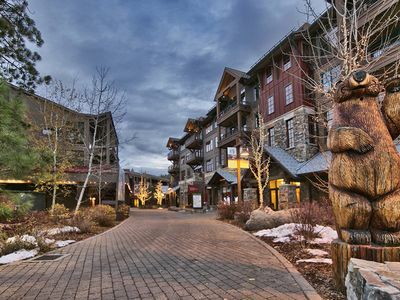 Northstar Mountain Resort and the Village at Northstar offers year-round activities. 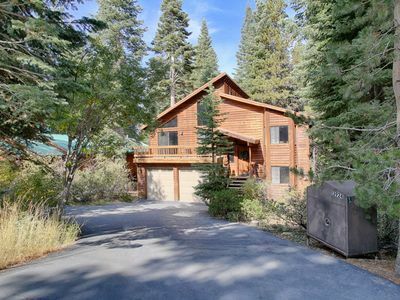 Bear Lodge is minutes away from the Northstar Mountain Resort slopes (one of the premier ski resorts in Northern California), hiking and biking trails, horseback riding, golfing and more. Enjoy the world class restaurants, cafes, boutiques and speciality retailers at the Village. 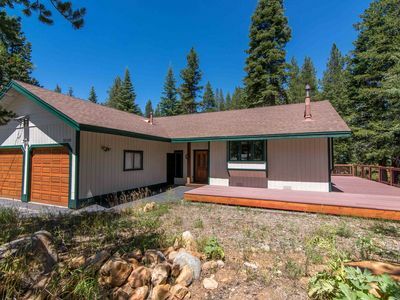 You will find easy, nearby access to Tahoe's quaint surrounding communities - exploring historic downtown Truckee, Tahoe City or the enchanted West Shore! 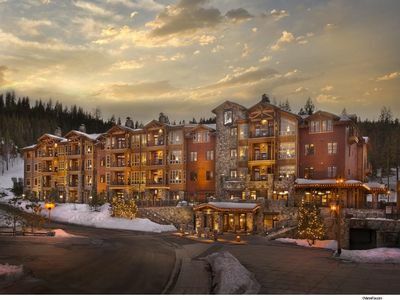 For further information visit: Northstar California Resort. 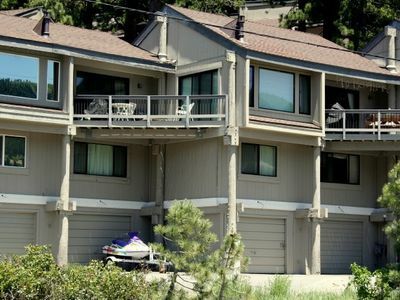 Guests have access to NPOA Recreation/Fitness Center located at the Village at Northstar. Two key cards are provided to guests to access the various amenities at the Recreation/Fitness Center. Guests will find the key cards inside the home upon their arrival. A minimal daily fee applies (cash only). For further information about fees, hours of operations please call (530) 562-0320 or visit: NPOA Recreation Center/Amenities. Enjoy the complimentary door to door Northstar shuttle that takes you to the slopes, Village at Northstar, NPOA Recreation/Fitness Center, Golf Course or to any other activities in Northstar. For further information about hours of operations or for shuttle pick-up call: (530) 562-2257. Pick-up/Stop #: 333 Skidder Trail. Standard amenities: All SkyRun properties feature standard amenities including WiFi, cable or satellite, well-equipped kitchen, quality bed linens, top bedding, bath and kitchen towels and a starter kit of shampoo, conditioner, body wash, lotion, dish soap, laundry detergent, paper towel, toilet paper, kleenex and trash bags. Coffee Maker: standard/drip and KEURIG - K-pods can conveniently be purchased at the Starbucks in Northstar Village at at local grocery stores. - Snow Plowing: Yes - roads and driveways are plowed when 3" or more of snowfall accumulates to keep roads and driving conditions as manageable as possible. PARKING: 1 vehicle in garage, 3 in driveway (Caution: driveway is a bit steep and can icy and slippery during inclement weather). Parking can be strictly enforced. To avoid ticket or towing, please adhere to posted signs and parking allocations at all times. There is NO parking on the street due to snowplowing and other activities throughout the year to keep the streets open and clear for vehicle use. SkyRun is not responsible for any damage that may happen to your vehicle(s). AWD and/or 4-wheel drive is recommended during inclement weather as driveway is steep and roads can be icy. Garbage pick-up is on Mondays mornings. If your stay falls over a Monday PLEASE remove all trash from property, place in garbage receptacles and move garbage cans to entrance of driveway (on Monday am) for pick-up. PLEASE DO NOT pull garbage cans to the curb the night before due to bear and other wildlife activity. Should you have excess trash during your stay, please take to the Northstar Dumpsite located on Northstar Drive - from Basque Road, turn left onto Northstar Drive. The entrance gate in about 100-150 feet on your right hand side. You will need a NPOA key card (located at the property) to access the gate. Please do not leave excess trash, open food containers outside or around premises or in vehicles as this may pose visit from bears and other wildlife. THANK YOU! As your vacation nears, please take a few moments to re-visit the SkyRun Rental Terms & Conditions on our website or at SkyRun Rental Terms & Conditions. - Store all winter/summer equipment, gear (skis, boots, poles, snowboards, helmets, bikes, beach chairs/items, etc) in garage. Items are prohibited inside home. - Guests who occupy this property who are under the age of 25 must be accompanied by a parent or guardian. 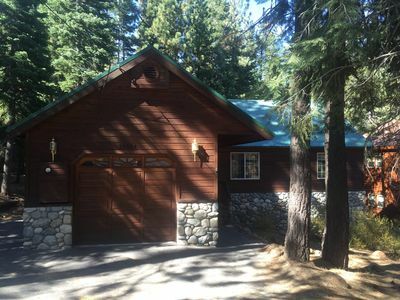 - Parking: 3 vehicles - garage and driveway parking. No parking on streets. 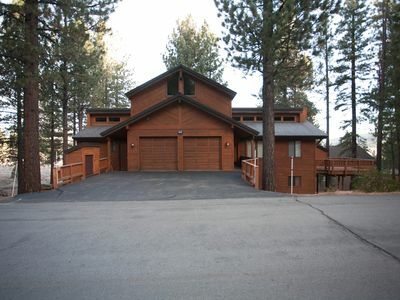 7/5.5 (5k ft) on Golf Course- sleeps 20! - NEW M-W $695 Winter Special! BEST VILLAGE LOCATION! Northstar Village 1br Loft Condo-steps To Everything! 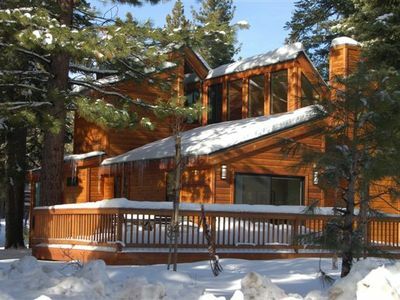 Enjoy this Cozy Winter Wonderland Home at Northstar Resort! 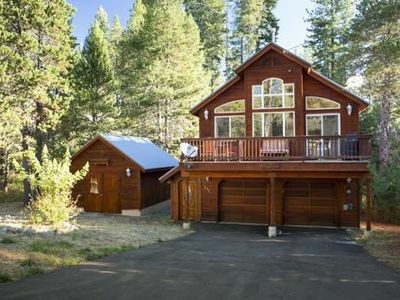 Whitetail - Luxury 3 BR at Old Greenwood with HOA Amenities and Ski Shuttle! 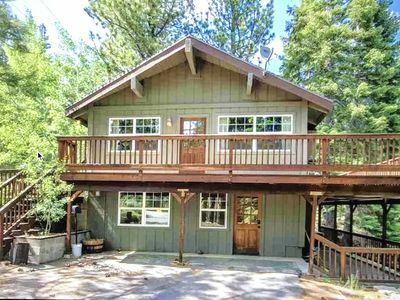 2 Bedroom, 2 Bath in the Heart of Northstar Village!